Dudley loves to paint children, and they come to life on her canvas. As with all small children, they love to play and enjoy the pleasures that come with their energy and imagination. 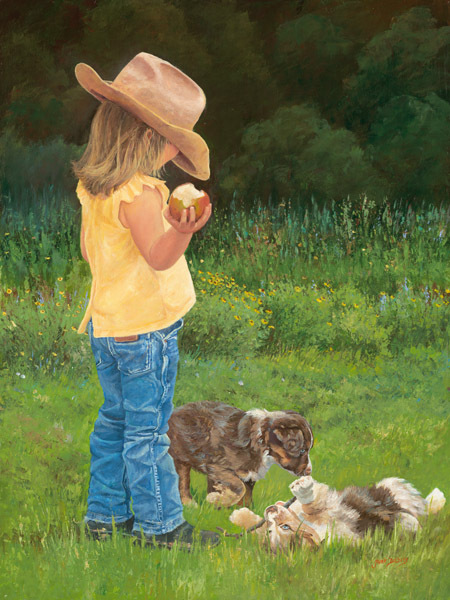 This little girl, decked out in her cowgirl finery, enjoys watching her dogs play. She also takes time to eat a delicious apple. The colorful field of flowers is the perfect place for her and her frolicking friends to enjoy their time outdoors.